KIPS BAY — Children disappeared nearly 1,600 times from an Administration for Children's Services facility, which many of them described as being a cramped and chaotic environment plagued by bullying and theft, over a 13-month period, DNAinfo New York has learned. The NYPD returned many of those children to the agency's custody in handcuffs through a system that critics have decried as criminalizing the youths, many of whom have been abused and neglected and are sent to the facility to await foster care placement. From February 2013 to March 2014, the agency filed 1,583 missing reports with the NYPD for kids who ran away from their Children's Center at 492 First Ave. near East 29th Street — roughly four a day, according to records obtained by DNAinfo through a Freedom of Information Law request. In one case, a 17-year-old boy was reported missing at least 50 times in a five-month period, sometimes twice a day, according to the records. A number of the other children disappeared multiple times as well, so it was not clear how many individual children vanished in all. 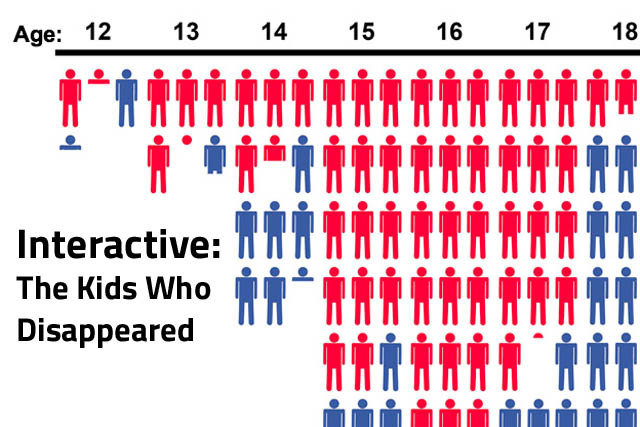 More than 70 of the reports were for children just 12 or 13 years old. Dozens of the missing kids were coping with medical conditions including asthma, bipolar disorder, posttraumatic stress disorder and schizophrenia when they disappeared, according to the reports. Officials from the NYPD and ACS would not say how many of the children have returned. ACS is not allowed to stop children from leaving the facility unless they have serious mental or physical health issues, officials said. The 55-bed facility, officially known as The Nicholas Scoppetta Children's Center, provides emergency shelter for more than 10,000 kids per year from birth to age 21, including those who have been neglected or abused or have nowhere else to go because their parents have been arrested, according to an ACS spokesman. It is the only shelter of its kind in the five boroughs. Children are not meant to stay there for more than a couple of days, but older teens can end up staying weeks or months, because it's harder to find foster homes for them, according to the spokesman. Parents, children and lawyers contacted by DNAinfo painted a troubling picture of the conditions at the Children's Center that encouraged kids to flee. Those familiar with the facility described staff members as indifferent and sleeping arrangements as uncomfortable — with 12 or 15 people crammed into a single bedroom. Lights were left on all night, making it impossible to sleep, they said. And an ACS representative admitted that staff members had previously told children they were free to go if they had complaints. One of the kids who disappeared was 16-year-old Gabrielle Whitmore, from Alphabet City. Four days after the city took her away from her mother earlier this year, she vanished. For Whitmore, the Children's Center was a nightmare. ACS lost all 13 duffel bags filled with her belongings, she said, including her clothing, her jewelry and the notebooks where she wrote rap lyrics. She also said she was bullied by other teens at the center and received no treatment for her depression, serious emotional disturbance and ADHD. On the morning of Feb. 6, 2014, Whitmore reached her breaking point and walked out. Nobody stopped her and, until she returned to her mother's home two weeks later, no one in her family or at ACS knew where she was. Whenever a child leaves without permission, ACS files a missing report with the NYPD and usually seeks a Family Court arrest warrant for the child, which can lead to the child being returned to the city's custody in handcuffs if necessary, according to court officials, ACS, families and the children. The purpose of the warrant is to bring the child to Family Court and it does not allow those children to be mixed with the criminal population, according to David Bookstaver, a spokesman for the state's Office of Court Administration. “That gives [ACS] the authority to retrieve the child,” Bookstaver said. But advocates say children who have been abused and separated from their parents should not be handcuffed because they have not broken a law. “We object to warrants," said Tamara Steckler, attorney-in-charge of the juvenile rights practice at the Legal Aid Society, a nonprofit that provides legal services to low-income New Yorkers, including children entering the foster care system. “They shouldn’t be arrested and handcuffed. Going AWOL from the center is not a crime." Steckler added that a missing person report gives police the same power to search for the child without explicitly being tasked to arrest them. Iris Estela said ACS allowed her 15-year-old daughter to walk out of the Children's Center at 1 a.m. last November, and then police brought her back in handcuffs. "I didn't understand that system," Estela said. "She was getting agitated because they had her in handcuffs." ACS officials admitted that the warrants have an unintended consequence of criminalizing kids who may have already been subjected to trauma, and said the agency is working on doing away with the practice. "We are working with the parties involved to make the process of returning a child who has left one of our facilities unsupervised as smooth as possible for the child and the family," said ACS spokesman Chris McKniff. ACS, which performs searches with the NYPD, has also begun waiting 24 hours to report children missing to give them a chance to return instead of notifying police immediately. After hearing about the poor conditions in the ACS center, Rosemarie Rutigliano, Whitmore's mother, said she fought successfully in court to keep her daughter at home. “She needed a therapeutic setting,” said Rutigliano, who has leukemia and lupus and had struggled to care for her daughter. “The doctor said she is extremely emotionally disturbed, but they don’t care that she has treatment. Oleg Moldavsky, a Brooklyn resident, said he asked ACS for help with his 16-year-old daughter last year because she was running away from home and using drugs. But when ACS sent his daughter to the Children's Center in August 2013, things just got worse, he said. “They were encouraging these kids to run away,” Moldavsky said. “Instead of helping her by offering children psychology or rehab, they just don’t care." The daughter, who is now 17 and asked that her name not be printed, said she was frustrated when other shelter residents stole her clothing and a necklace that had belonged to her grandmother. But she was even more upset when she was ignored after repeatedly begging ACS staff for kosher food, she said. For three days, until she walked out last Sept. 1, she sustained herself in the center by only eating apples. “It’s the worst thing I could imagine,” she said. “If you complained, they basically said, 'If you don't like it, you can leave.'" ACS officials said that the facility ordered special meals for children who keep kosher and have other dietary restrictions. It also tries to avert theft by securing children's belongings in lockers and offers activities to create a good environment such as arts and crafts, poetry workshops and field trips. In cases of bullying and fights, child care counselors and social workers intervene, officials said. "Through a multitude of in-house and outside activities, the center makes every attempt to provide a safe, welcoming and nurturing environment for young people who need support during difficult times in their lives," McKniff said in a statement. The agency also works with Bellevue Hospital and local nonprofits to provide psychiatric services to the kids at the center, McKniff added. The state's Office of Children and Family Services, which oversees the facility, "conducts regular site visits and is routinely engaged in discussions with the leadership of the Children’s Center to monitor compliance with state regulations,” said Jennifer Givner, a spokeswoman for OCFS. Givner declined to say if the state had received any complaints about the center or issued any violations. Melanie Garcia, who lives in Brooklyn, said her 18-year-old son ran away from the center at least 10 times in seven months after he was placed there for behavioral issues, sometimes disappearing for days at a time. He was arrested at the Children’s Center last Christmas Eve for helping a group of kids rob another child living there, she said. When he returned to the center after spending a couple of weeks in jail, all his belongings were gone and his caseworker told him the staff had let the other kids go through his things and take what they wanted, Garcia said. “My main focus was to keep him calm until he could get out of there,” Garcia said. “He can get very angry and he can act out." After his struggles at the ACS facility, she felt the only way her son would be safe and get better would be if he got out of city custody. Her son was finally accepted to a residential treatment facility in Michigan in June and is now getting the help he needs, she said.